The Canadian women built up steadily under the Beckie Scott/Sara Renner days, but haven’t quite found any replacement for these ladies (yet). The American women have generally bounced around flirting with mostly top-30 results, seeing a steady increase in these over the past few seasons. As recently as 2006-2007, the US women didn’t have a single top-30 result in 12 attempts. Since then they’ve progressed all the way to ~56% of their results being ‘in the points’ in 48 attempts. Obviously, Kikkan Randall’s been leading the charge here, along with Liz Stephen and Morgan Arritola. Kikkan Randall’s 11th place finish at the Lahti pursuit this year was remarkably good. I can find a grand total of 9 top-15 results by US women in WC, OWG, or WSC races since 1992, Randall owns four of them and all of them are either 14th/15th except for this one 11th place. Her FIS points from the Lahti pursuit (50.96) were deceptively high, thanks to Johaug and Kowalczyk skiing away from everyone. 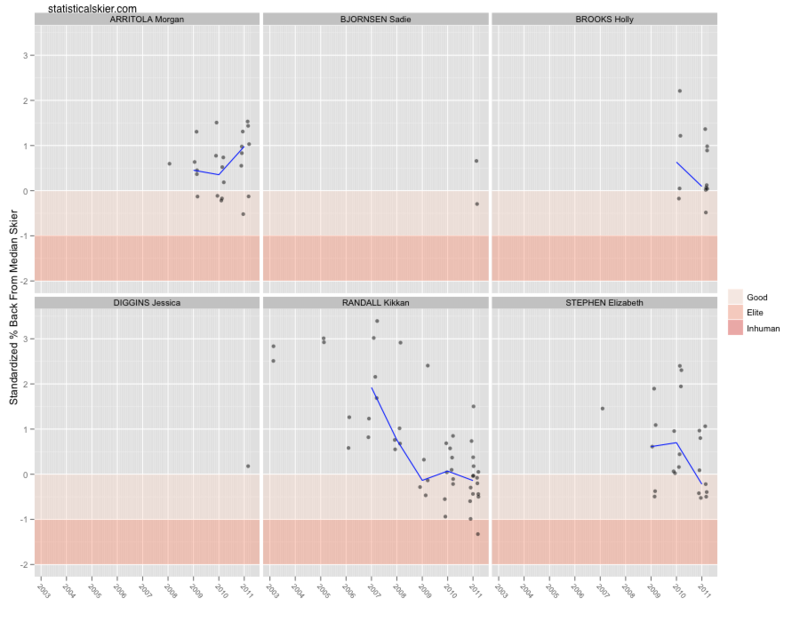 If you use standardized percent back from the median skier, that race is, by a healthy margin, the best US female distance result since 1992. In fact, it is one of only two that are more than one standard deviation better than average. Randall scored a -1.33 and the next best result by this measure is Leslie Thompson’s 17th place in a 10km freestyle all the way back in Davos, 1993, which netted her a -1.17. 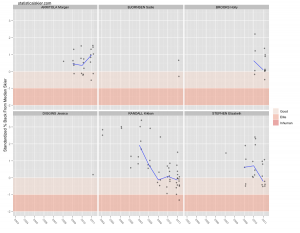 I included the panels for Jessie Diggins and Sadie Bjornsen mainly cause her one race was fairly good, but it’s kind of silly to graph one or two data points. Randall’s typical distance race improved modestly, Stephen’s seemed to have rebounded from her problems last year and had her strongest season so far, I think. Morgan Arritola’s season, unfortunately, didn’t go so well. It’s neat to see Holly Brooks racing solidly, along with the youngsters Bjornsen and Diggins. Posted by Joran on Wednesday, April 20, 2011, at 6:00 am. Filed under Cross Country. Tagged canada, Distance, kikkan randall, season recap, USA, women. Follow any responses to this post with its comments RSS feed. You can post a comment or trackback from your blog.